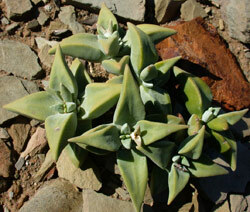 A unique and intriguing dwarf, grey-leaved succulent well-suited to pot cultivation. Crassula deltoidea is a perennial dwarf succulent that forms a dense low mound often not more than 50 mm high but spreading up to 100 mm, rarely wider. It consists of a few succulent stems rarely longer than 80 mm, branching occasionally, fed by a short taproot with occasional branching roots. 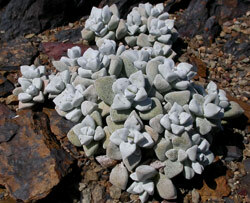 The highly succulent leaves are deltoid (triangular) or rhombic in shape and always covered to a greater or lesser extent with a grey flaking layer of wax, often giving the plant a grey or even white appearance (see image below of the Richtersveld form). The creamy white flowers are urn-shaped, about 3 mm wide at the mouth and about 4-5 mm long with the tip of each petal reflexing slightly to cause the flower to flare at the mouth. The many flowers are borne in a set of two to three branched inflorescences which arise from the tip of each branch. Flowering time is between August and September in the southern hemisphere. The fruits are small capsules which release dust-like black seeds which are wind-dispersed. Crassula deltoidea is a fairly slow-growing relative to other crassula species and can take a few years to form a sizeable plant and flower. In the wild they will presumably live for up to 5-7 years or perhaps even longer. In cultivation, under good conditions, the plants will last indefinitely. This species is not currently recognized as being threatened as it fortunately has a relatively wide distribution, mainly in arid areas not suitable for agriculture. 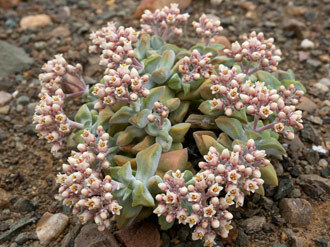 Crassula deltoidea is perhaps one of the most drought-adapted members of the genus and is usually found growing singly out in the open on arid gravel plains, blending somewhat with the surrounding stones. 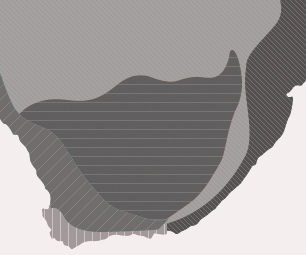 Its natural distribution extends from the southern parts of Namibia, Bushmanland, the Tanqua Karoo and southern parts of the Great Karoo as far east as Prince Albert. The specific name deltoidea refers to the delta shape of the leaf when viewed from above. Not much is known about the pollination of this species but the pale cream flowers and sweet scent would indicate that it is probably nocturnally pollinated by moths. 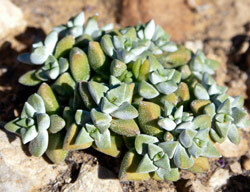 Crassulas are amongst the easiest succulents to cultivate and this species is no exception. The secret code for success is very well-drained gritty soils with a low organic content, good ventilation; and very bright light is essential. Being a dwarf novelty plant it is recommended to cultivate this species in a pot rather than the open soil. A sunny windowsill should therefore work well but to keep the plant naturally compact and grey, growing it outdoors in the full sun is recommended. Water sparingly and only when the plant becomes soft to the touch. As they are so drought-adapted their watering requirements are very minimal. 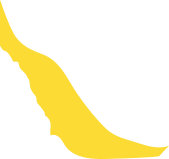 Overwatering is the easiest way to kill this plant as the plants are susceptible to fungal attacks which result in rotting. Feeding is not necessary and will only cause lush growth which will ruin the refined nature of the plant. Propagation is easy from cuttings, especially leaf cuttings, at any time of the year, which means they can be bulked up very easily. Remove the largest lowermost leaves by pulling them away and to the side, tearing them gently away from the stem. Allow the leaves to stand for a day or two, so the wound can dry and heal. Submerge lower half of the leaf in a dry gritty medium. Do not water the plants at this stage but rather keep them dry. Keep the pot in a bright situation out of direct sunlight where they will not get any water. After a week, they could receive a light sprinkling of water. Rooting should start to take place within 2 weeks. Once the leaf cuttings have visibly greened up, move them to a sunny spot, and before long young plantlets will develop into small rosettes. If one could ever acquire seed, this could be sown in autumn. Mix the dust-like seed with a small quantity of fine sand. Spread the sand evenly over the surface of the soil which should be the same as the growing medium. Water immediately, preferably from below by standing the pot in a tray of water every few days. Keep the soil moist like this for the first month or so. Before long, tiny green plantlets should appear on the soil surface. Start to let the soil dry out between waterings. Soon the plants will bulk up and if one achieves the ideal growing conditions, one can raise many thousands of plants like this. The use of a damping-off fungicide is advisable. Rowley, G. 2003. Crassula. A grower's guide. Cactus & Co. libri.